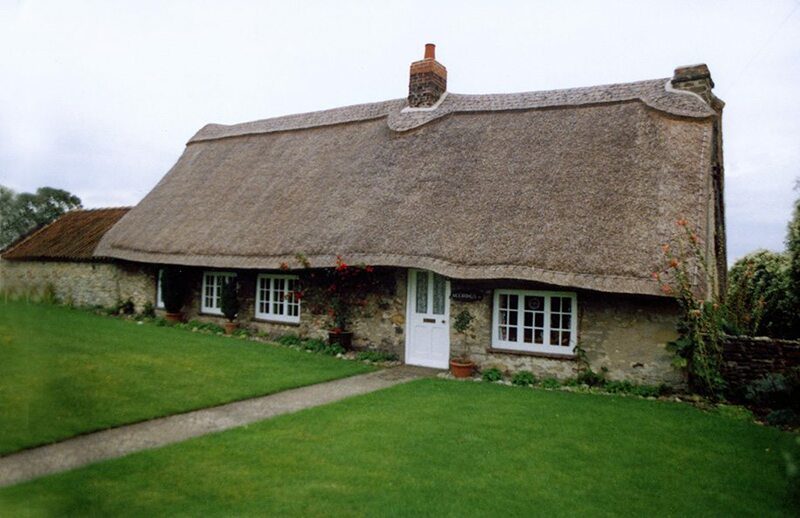 The type of domestic thatching, Farmer Best describes uses long straw, and much of what he has to say, is still relevant for today’s thatchers. But three and a half centuries have seen some changes. Henry was not too fussy, about the type of straw the thatcher used. Rye was the most common: ‘if it be had’, but wheat, oats and barley were also employed. No wild plants, such as reeds or rushes, are mentioned. So the farm, at Elmswell, must have provided enough cereal straw, for fodder, bedding and thatching. Henry liked his thatching straw well watered: ‘ …the wette strawe coucheth better and beddes closer’. But his practice of exposing the straw, to the elements and the farmyard pigs, from: ‘betwixt that time we gotte all in and the 17th November’, might just create a compost heap. The farmer liked the pigs, to remove all the grain that might sprout on the thatch. 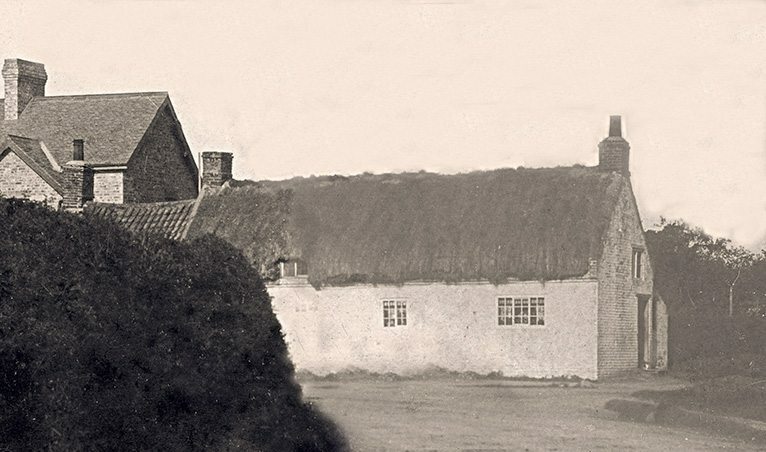 1641, the year described in Henry’s book, saw a fair amount of thatching; including some work on: ’18th November when the thatcher came.’ The farmer says the pigs had been removed… It would seem he was employing a professional, to carry out the job; assisted by two farmworkers. As was often the case, a couple of women were given the job. Henry Best, also kept detailed accounts of his expenses. Through these, we can shed a little light, on the good ladies helping the thatcher. He was wary of hiring: ‘maids of a sluggish and sleepie disposition’. But usually had a couple of: ‘good lusty mayd servants’, on the payroll. When the thatcher called he had three. 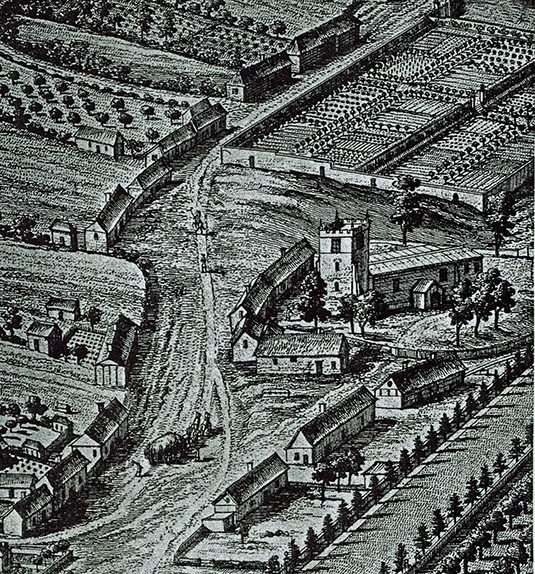 These had all been newly hired at Martinmas, which fell on 11th November 1641. Ellin Edmonds, was paid less than her fellows; probably being quite young, so it was Alce Foxe and Joane Tenny, who probably helped out, that mid November. They were all hired for the year. On top of board and lodging, Alice received 32 shillings a year; Joan, a little more. Henry had sealed their Martinmas contracts, with his: ‘godspenny’… 2 shillings for Alice and 18d for Joan. Ellen needed new clothes; Henry supplied some shoes, a hat, a waistcoat and some lace. This cost him 9 shillings and 7d. This was a common practice, as was finding room, for any sheep or cattle a servant may have. On that November day, one of these women was employed, ‘drawing‘ or yealming the straw. She was given dry oat straw, to tie up the yealms into ‘bottles’. The other woman then carried three or four bottles of thatch, up to the thatcher. She also provided ‘mud‘, which the thatcher probably used as a fixing. Henry Best is unclear, as to the exact methods used, to coat his property. Thatching spars are not mentioned, so it could be that the ‘bottles’, which were probably a little bigger than the normal long straw type; were pushed into the old coatwork; in a stobbing fashion. Wet mortar/mud being spread, on the top of each layer of bottles; with the succeeding layer bedding down into this mix… This was a popular thatching method, in North Eastern Scotland, until recent times. As was the farmer’s habit of coating the outside of loose thatch, with weak mortar/mud mixture. Henry says any work on new timbers, was tied on with straw rope. Small change… It’s perhaps useful to see the type of money, changing hands on Henry Best’s farm. At this period silver money was still of good quality. With the value, in pennies in roman numerals; on the larger coins. 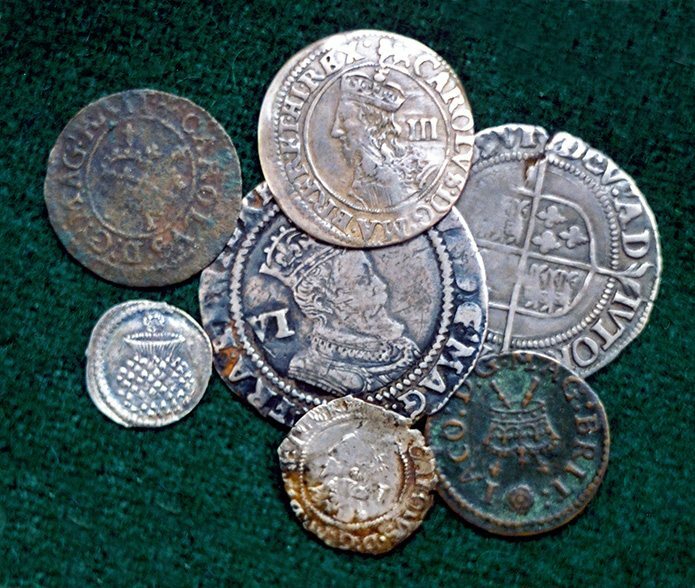 But base farthings now plagued the poor; and reaped the king’s favourites, who issued them, a tidy profit. Our man has also left of list of his thatchers tools, which seem to confirm these methods of working. The tools are: ‘a rake with three or four teeth, two needles for sewing, an eiz knife for cutting the eaves, a swiching knife, for cutting even and all alike, a slice …(to) striketh in the thatch, a trowel for mortar…’ These equate to a thatcher’s side rake, eaves hook and slice… (All described in the Materials and Tools section.) The ‘swiching knife’, was probably a home made hook, based on an old scythe blade. Autumn, was then the traditional time for thatching, but our farmer really preferred to leave things until the spring: ‘…for then the days are long …and later in the season it will not gette a man heate in a frosty morninge, sittinge on the toppe of an house wheare the winde commeth to him on every side’. Anyone, who has ever been on a cold frosty roof will agree with that! As was customary, food was provided as part of the thatcher’s wages. Henry says that the rate, for a long summer day was 6d; the short winter ones paid 4d. Without food, the rate was 10d a day, but he never paid more than 4d… But he wasn’t a mean employer; as he also gave breakfast at eight, dinner at noon and supper at seven. Each meal being of: ‘fowre sevices…Butter, milke, cheese, and either egges, pyes, or bacon, and sometimes porridge insteade of milke’. Three, four course meals had to be worth a few pennies a day. Also, given his views on frosty roofs, Henry seems to have been a good master. The farmer did not mention his thatcher’s name. Possibly he came from one of the local hamlets. Like most other rural craftsmen at this time, he probably plied his trade, in conjunction with a little farming. He may well have rented a smallholding from Henry; annual rents were around 15 shillings. Smallholdings… This is the village of Londesborough, a dozen miles from Elmswell. The print shows a scene, a century after Henry’s time, but allows us to imagine, what type of housing Henry’s thatcher worked on. Cottages here, seem to be mostly single storey, long houses. Which kept the inhabitants most valuable assets, their animals; safe at one end of their property. As mentioned, in an earlier page in this section, this area used more than one name for the craft. And Henry happily uses both Theaker and Thatcher, in this ditty. Which was set in the days of public hangings, where the unfortunates were turned off a ladder by the executioner. Gallows humour indeed. Henry Best has left a fascinating insight, into the craft and his world. Which was about to change dramatically. Before the next harvest was gathered, a sad civil war would envelope this part of Britain. Henry, his workers and the thatcher, would then have all appreciated some humour; gallows or otherwise, for the next few years.